Photobooks aren’t the only types of books arriving at my door step. There are also books about photobooks or about photography in general. The following discusses three such books that I recently engaged with. 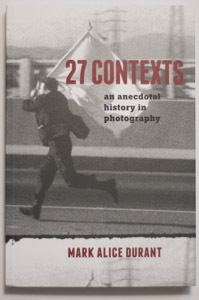 I initially approached Mark Alice Durant‘s 27 Contexts with the wrong mind set, having misread its subtitle as “an anecdotal history of photography” instead of “… in photography.” I’m not sure what I would have expected to find had I paid more attention. I’m not even sure I would have approached the book differently. But my misreading provided yet another reminder that every book that I encounter is not necessarily treated on its own terms. Instead, I approach it with my own preconceptions in mind, however much I might attempt not to do so. Not to get too hung up on the differences between two characters that form two very short words, but Durant’s book in fact is also what I thought it would be, an exploration of photographs against the background of the author’s biography. Mostly, though, the focus is on the private and professional life itself and the photographs arising from or directly connected to it. It’s a life that started in a suburb of Boston, moved all the way out West, and is now back on the East Coast in Baltimore. Much like any artist’s life, Durant’s has been filled with ups and downs. A creative life wouldn’t be one without periods where it’s anything but that, creative, periods where things appear to be falling apart more rapidly than they can be put back together again. Much to his credit, Durant does not shy away from including what others might have been tempted to exclude. There is a richness to the experience of reading about this particular life, as presented by the person living it, a richness that often is absent from other such books. This richness is not just due to the fact that Durant is an excellent and engaging writer. For me, it also arises from suddenly becoming interested in, let’s say, the kind of performance art he was engaged in for a while or from seeing certain photographs discussed under a different angle. Thus, 27 Contexts isn’t “just” someone’s autobiography (let’s just call it that). It is such a chronicle against the vast background of this larger cultural medium that surrounds us with images, while we make some ourselves. We can’t help but act against this background. But most of us aren’t as conscious of what we’re doing and what we’re exposed to. 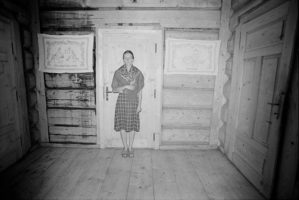 To be able to read about how certain photographs imprinted themselves on this particular biography makes for the finest reward this book has to offer – and it might nudge us towards paying closer attention to the visual backgrounds of our own lives. I’m extremely skeptical about many ideas of collaboration that are being floated in the world of photography, especially when it comes to portraiture. So it would seem that Daniel Palmer‘s Photography and Collaboration was not necessarily written for someone like me. But I’m also very eager to get my horizon and thinking expanded, and what better way to do that than to have someone make an in-depth case? Thankfully, Photography and Collaboration goes much beyond the idea that all portraiture is collaboration. Instead, it dives deeply into the history of photography to discuss a series of artists with this particular approach in mind: to what extent is their work based on some form of collaboration, however explicit or implicit it might (have) be(en)? This discussion of history happens in two separate parts. The first, covered in the first chapter (“Ideologies of photographic authorship”), provides a terse run across the medium’s larger history, examining various aspects. To be honest, I wasn’t sold on much in that chapter. The book’s real meat, however, is provided by the remaining chapters, “Photography as readymade,” “Photography in the name of community,” “Photography as social encounter,” “Found photography and social networks.” In each of these chapters, three artists (or groups of artists) are discussed in detail following the larger framework. These sections are well researched and can easily serve as introductions of the artists in question in their own right. Investigating an artist with the idea of collaboration in mind can make for very interesting insight. It might be obvious why and/or how Adam Broomberg and Oliver Chanarin collaborate, but how is, let’s say, Joachim Schmid potentially collaborating with those whose pictures he finds? On top of that, the usual suspects here mix with artists that aren’t discussed as often as they should or that maybe usually exist in different contexts (think Douglas Huebler). I’m not sure that the work of all of the artists discussed in the book is at the same artistic level. But to insist on that would surely miss the point (and tilt the book back towards the same old usual suspects). Instead, Photography and Collaboration offers a way to (re-)engage with artists under a very specific angle, namely to what extent their work relies on or works with outside input that usually is just swept under the rug. It would also miss the point if a reader (like this one before he read the book) would insist on agreeing with the author on every single point (I still don’t believe portraiture is a form of collaboration). 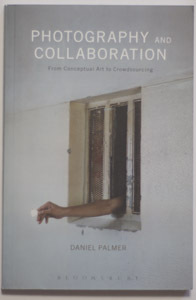 Palmer’s larger point is to open up our thinking around art as that activity solitary, isolated human beings engage in, to put it back into the larger world we all – including those artists – live in. If anything, in our hyper-individualized world that’s an important point to make. 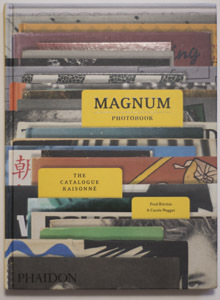 Magnum Photobook by Fred Ritchin and Carole Naggar is billed as “the catalogue raisonné.” And the book does indeed provide a listing of all photobooks ever made by all Magnum photographers at its very end. The list of photographers includes everybody who ever was part of agency, whether they stayed or not (if I counted this correctly, that’s 85 men and 11 women). That’s a lot of photographers making a lot of photobooks (also, that’s really not a lot of women). The larger, main section of Magnum Photobook covers examples of these books – one per photographer, Parr/Badger style. One could possibly have a debate concerning which book was selected for each photographer (for example, I’m baffled by seeing Chris Anderson’s Stump and not Capitolio). But at the end of the day, such a discussion might not lead anywhere. The larger question appears to be what actual insight is provided here. Actually, I’m not sure. What we learn is that Magnum photographers have made books (some of them a lot), and the sum of these books adds up to what you might imagine it does, considering the agency, while successfully living off a reputation established over 50 years ago, now is a fairly amorphous group of photographers that reflects the world of photography at large, at least how it’s currently established in the West. What does this tell us, though? In terms of the books, there isn’t much more to learn, either. How can you even compare, say, Philippe Halsman’s Jump Book or Martin Parr’s Common Sense with Philip Jones Griffiths’ Vietnam Inc. or Abigail Heyman’s Growing Up Female? The answer is obvious: you can’t. The former are shallow entertainment, and the latter are anything but that. This is not to say that there’s anything wrong with the idea of this book. On the contrary. It’s about as good as a taxonomy of Magnum photographers’ photobooks could get. But maybe what is to be learned is the following. For any such meta-book to offer insight it has to go beyond these very broad kinds of categories that are being used left and right, whether they’re geographical or whatever else. Let’s face it, the good books about photobooks aren’t good because of their categories, they’re good because in those categories such great material exists. Where the material is as mixed as it is in the case of Magnum photographers, you end up with, well, something like this book, especially given all these very different books are presented with equal weight. That’s good for crossing the bar provided by the main idea – a catalogue raisonné of Magnum photobooks. But beyond that, for me it’s really not terribly interesting at all. There are enough photobooks here, to give just one possibility, to look at the evolution of the photojournalistic photobook in more detail. The photographers obviously aren’t the same, but with each new generation there appears to be a push towards a slightly different form. Obviously that’s a different catalogue raisonné. It’s here where I see most of the potential of the book about photobooks. The librarian’s approach has given us Parr/Badger etc., and that’s great. Now, I’d like to see more in terms of depth, a depth that a simple survey just can’t offer. And so the mighty photobook machinery churneth out book after book after book. Even I get saturated at times. My current strategy of dealing with the flood (deluge?) of photobooks is to flexible with my engagement. Instead of turning away, possibly like when being hung over — “I’ll never have a drink again!”, I’ll re-engage with books I already own, ignoring what’s coming in for a little while. Now, if you happen to be one of the people who sent me a book while that’s happening: fear not! I do engage with all of them, just not all of the time. So here then are reviews of selected books that somehow made their way into my office over the course of the past weeks. Those who know me, maybe from the classroom, are aware of the fact that I have literally no patience for either the cult of the youth in photography or for the idea that age somehow is correlated with creativity and/or activity. OK, fine, you have your research to show there is some sort of correlation, but I’ll counter your Vox-style argument (which is based on the popular, yet completely flawed idea that you can understand the world by simply gathering measurable facts about it) with “correlation does not imply causation” (which forms one of the bases of all science relying on statistics). For example, if you want to picked up your camera at age 67 to photograph every household in, let’s say, Poland, then you could just go about it. Chances are you might not succeed in fulfilling that task. 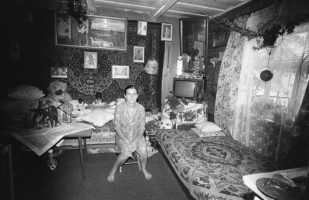 After all, there are millions of people living in Poland, and to take a picture in literally every home is a bit like Santa Claus visiting every child for Christmas. You would have more time than Santa Claus, of course, but the numbers are pretty badly stacked against you. 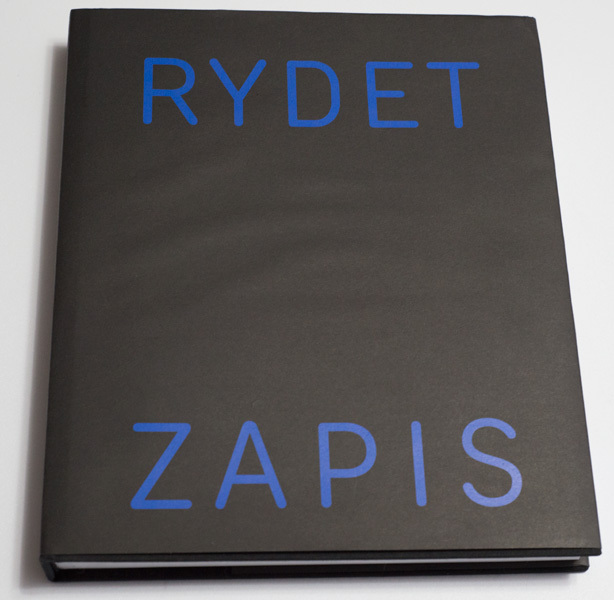 Zofia Rydet did it anyway, producing her Zapis Socjologiczny (Sociological Record). In the photographer’s words, going about this was easy: “I knock on the door, I say ‘hello’ and I shake hands. I enter the home, look around carefully, and I immediately see something beautiful, something unusual, and I compliment it. The owner is pleased that I like it, and then I take the first photograph. Everyone has something in his house that is most precious to him. If I manage to notice this, then this person submits at once. I take advantage of this moment. I ask them to have a seat (this is very often a married couple) in front of the main wall, the most interesting one, the one most decorated with pictures and tapestries, and I take the photograph.” In that interview, you’ll see Rydet wasn’t just interested in every home. She preferred a certain type of home, away from the cities (there’s a marvelous video you want to watch). I first came across Sociological Record when I went to Poland last year. The website contains a huge number of photographs, but somehow clicking my way through them didn’t feel right. So when I went back to Poland, I looked for a book, which led me to Zapis Socjologiczny 1978-1990, a catalog produced at the occasion of an exhibition last year. Just to get this out of the way, the book has two minor problems (for me): the text is all in Polish, which I can’t read (clearly, that’s my own problem, not the makers’ fault). Plus, the print quality is a bit mixed. But getting such a large set of Rydet’s photographs easily outweighed these drawbacks for me. 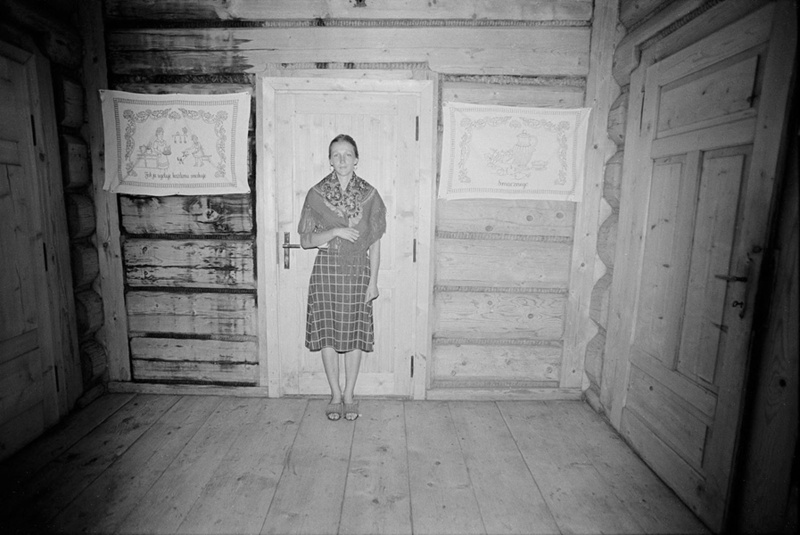 The photographs in Zapis follow a few basic patterns. 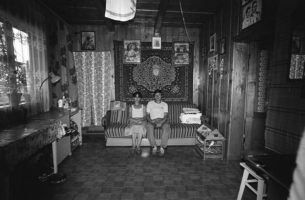 There are pictures of people seated in their homes, photographs that remind me of artists like Chauncey Hare or Bert Teunissen. In addition, the viewer is treated to depictions of the outsides of some of the homes, and there are portraits of elderly women standing in the open front doors of their homes. Rydet’s work derives its strength from its cumulative effect. It’s almost entirely irrelevant whether each and every one of the photographs on its own is a great picture. Here is an aspect of photography that we possibly need to re-explore, the cult of the gem photo, where a project can only contain very good pictures. As Rydet shows, there are other ways. Maybe the fact that she was not producing work for the heavily commercialized gallery market worked in her favour of opening up her mind to seeing the — pardon the pun — bigger picture more than the individual gem. 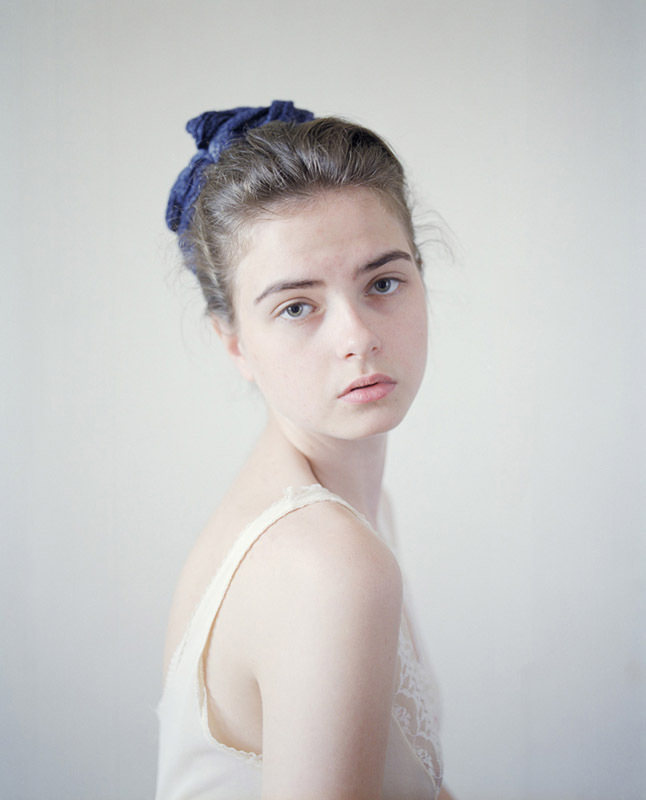 This is not to say that these photographs aren’t good. They are. Some of them are amazing. They all are poignant in the kind of innocence sense that has a hard time surviving in market dominated environment we now live in. Zapis Socjologiczny 1978-1990 is not just an immense gift to Poland. It’s also one for the rest of the world, even though outside of Poland, people might treasure the work for different reasons. Or they might be drawn to, as I said, re-thinking the assumptions that underlie their own approach concerning photography. 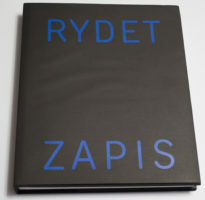 If one thing is clear, there really is no excuse any longer for excluding Zofia Rydet from the history of photography. I don’t intend to produce these reviews around themes, but at times, that just happens. So here’s the theme: retrospective. 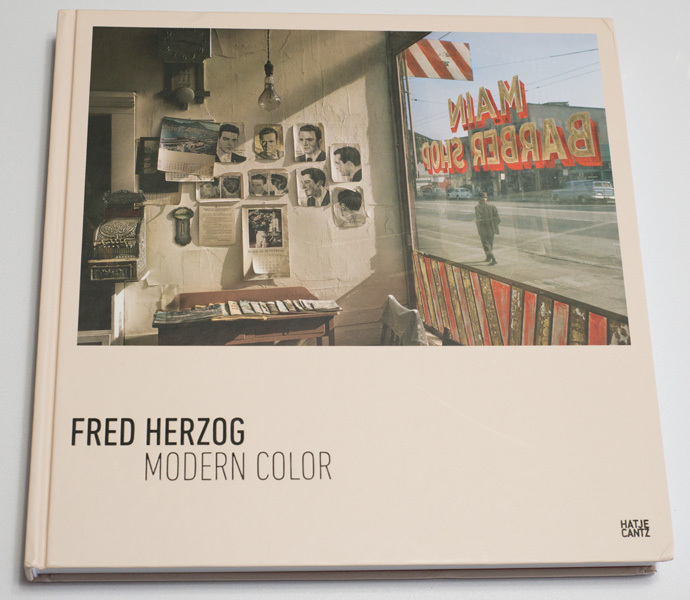 Fred Herzog‘s Modern Color was waiting for me when I came back from Poland with the Zofia Rydet book. Unlike Rydet, Herzog has made it into the history already in those ways that our somewhat hype obsessed culture deals with those things: instead of changing the history, the addition is framed around the newly member’s exclusion, which is then written about gushingly ad infinitum (the most spectacular example of that, of course, is Vivian Maier). At the same time, the new addition is squeezed into the same-old Procrustean bed that has served us so poorly in the first place. In Herzog’s case, it’s his use of colour (sorry, I prefer the British spelling, because that’s how I learned it in the first place). Not to go into too many details here, but Herzog clearly made incredible use of colour film, creating photographs that are a sheer pleasure to look at. But we have the history of (art) colour photography established. So instead of re-framing everything around Herzog (and, possibly, a few others such as, say, Saul Leiter), he’ll have to fit in with the usual Eggleston-MoMA colour complex. And then some references to the other usual suspects (Walker Evans) are being thrown in for good measure. Make no mistake, I get the idea where this approach is coming from. It has a lot of merits, as David Campany’s essay in the book makes clear. At the same time, though, sometimes you need to step back from what you have, have a hard look at what is in front of you, and then think about whether disassembling and re-assembling might not be a better approach. That way, those newly added don’t merely become supporting beams of what we all take for granted. If you think about it, this approach actually diminishes the newcomers’ achievements considerably. In addition, the problems with the current add-on approach becomes vastly bigger once we’re dealing with artists outside of the larger context of Western culture, for whom the likes of Walker Evans or William Eggleston often are simply completely useless reference points. I don’t write much about the history of photography, so I might have to leave the job of re-framing the discussion to others. I do realize, though, that what I’m asking for is both a revision of the history of photography and institutional critique of its writing at the same time. That’s a lot to ask for. Anyway, I was excited about the idea of Modern Color because I had wanted a larger number of these pictures in my library (I think I have a copy of Fred Herzog: Photographs somewhere, but I can’t find it right now). The good news is that now I do. But there are some bad news. To begin with, even though I usually don’t mind pictures crossing the gutter, when they do I expect the book to lie reasonably flat so I can see everything. That’s not the case here. Right after the essays, Herzog’s famous Man with Bandage loses the arm he’s raising unless you apply considerable force to try to make the book lie flat. If you don’t, he becomes Man with Bandage and Disappearing Right Arm. That’s the kind of very basic problem with book making that simply shouldn’t happen. In addition, the pairings of photographs all are frustratingly simplistic. If on the left page you have, say, a picture of a fence, then you’ll have another picture of a fence on the right. That’s great for Photography 101, to teach students to look at form and content. But it’s really dumbing down photographs in a catalog. The good, actually very good news is that Modern Color makes available a vast number of brilliant photographs. The comparison is a bit unfair, but it’s unlike William Eggleston’s Democratic Forest reissue, where you got a lot more pictures, but the added insight did not necessarily correlate with the numbers. Here, I was amazed by many of the pictures I hadn’t seen before. Speaking of Eggleston, at the end of the day both he and Herzog might really be more formalists than anything else. OK, there are the American South and Vancouver, respectively. 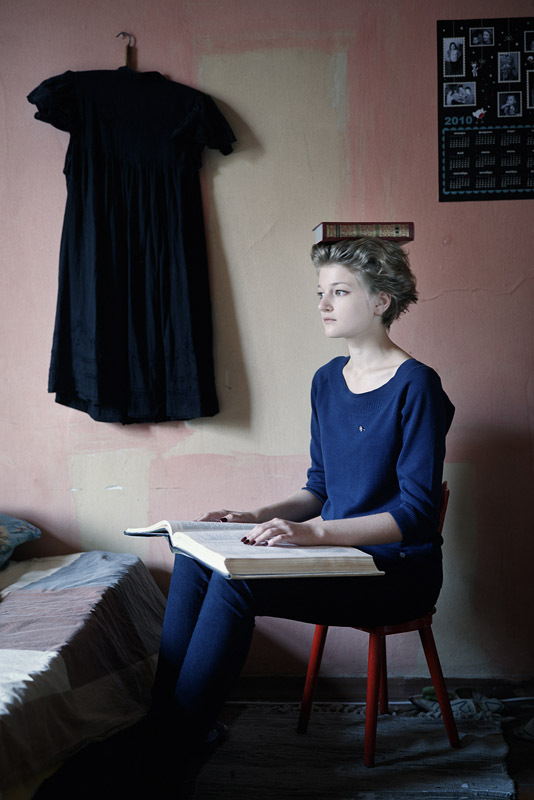 But I see both photographers too enamoured with the photographic frame’s form than with some larger whole to really buy into the stories created around their work. I don’t see that type of formalism as a weakness. In the hands of the likes of Eggleston and Herzog, it makes for marvelous photography. It is, for me, the essence of their achievements. There is an article about Chauncey Hare in Aperture Magazine’s American Destiny issue, which had me re-look at this particular photographer. I own a much thumbed through copy of Protest Photographs, one of those books that immediately grabbed me when I first acquired it a few years ago. In their The Photobook: A History – Volume 2, Martin Parr and Gerry Badger contrast Hare’s work with Walker Evans’, describing the latter — “the greater artist” — as “ironic and detached,” whereas the former is said to be “bleak and bitter,” but displaying “much more humanity” (how’s that for a consolation prize when you’re the lesser artist?). It’s important to note, though, that included in Parr/Badger 2 is not the Steidl reissue of the work, it’s the original book, Interior America, published in 1978 by Aperture. My copy of Protest Photographs was buried in one of those many piles of books in my office, so I went looking online to see what I could find. There was a 2011 article about Chauncey Hare and Marianne Wex, another artist whose work I recently have been looking at. Much like the piece in American Destiny, Hare’s seemingly curious actions are being mentioned: “Hare staged a one-man protest outside the exhibition ‘Mirrors and Windows’ at the San Francisco Museum of Modern Art in 1979 […] Hare was protesting, amongst other things, against Philip Morris’s sponsorship of the show and the inclusion of one of his images in it.” This action was described by Jack van Euw (“who oversaw the 2009 publication of a new Steidl edition”) as “career suicide.” Seeing those words and feeling queasy about the exclusion of the wealthy in Aperture Magazine’s supposed survey of the socio-political landscape of the US then had me write my piece. There’s a problem spelled out here, and it’s the problem that I feel many artists would love to pretend it doesn’t exist: if what you believe in at least in theory is at odds with the way the art market (and, by extension, the larger world of art photography) operates, how do you go about it? Hare’s solution was clear: he would protest the corporate sponsorship of a show he was in simply because his work centered on what he saw as the central problem of American work life, namely how said corporations were exploiting their workers. For others, that simply looked like “career suicide.” I can’t help but notice how whenever you read or hear something about this photographer, there appears to be a tacit understanding that, well, Hare was certainly being a bit too difficult there. Apart from finding a select few pieces about Hare, my internet research also led me to a copy of Interior America for $1. It was an old library copy I was informed, which was all the more of a reason to buy the book. What library would remove this book from circulation? I found out when the book arrived from the UK. In addition to this fine book being not available to students any longer, somehow these days it’s also economical to send the book thousands of miles for something less than the price of a fancy coffee. It boggles the mind (well, mine anyway). Books that were published many years ago don’t get reviewed any longer. Maybe that’s something we ought to change. After all, when they’re still fresh, when the inks have barely dried and the PR hype is at its most relentless — is that a good time to review a book? I usually take my time with a photobook before I review it. A book might only reveal its true value after a fairly long period of time (or it might turn out to be just as lousy as the first impression indicated it would). The books I come back to usually aren’t the ones that are immediately appealing to me (there are exceptions, of course). There is this story that when The Americans was published, it got panned by critics, only to later reveal itself as a masterpiece. Whether or not this story actually is true is a lot less interesting to me than the larger idea behind it, namely that the passage of time can help us evaluate art (or photography — photography can be art, but often enough it is not). 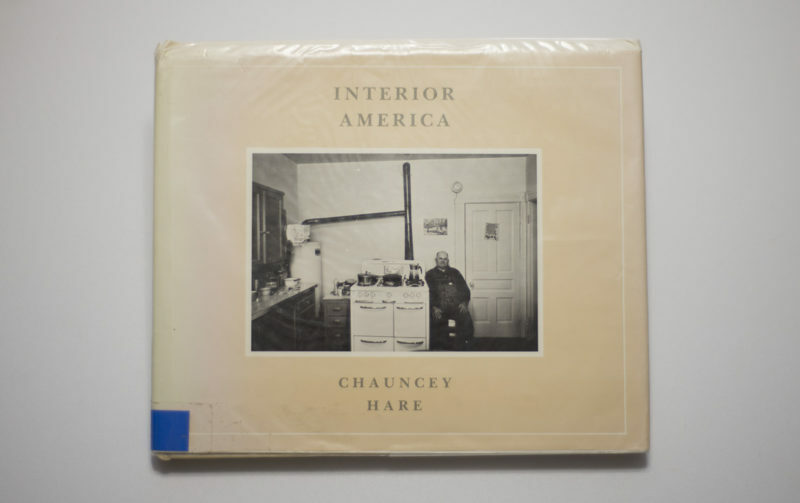 Chauncey Hare’s introduction to Interior America is worth the price of the book alone. Protest Photographs also opens this way, but it is a different text, one written by the Chauncey Hare who had resolved his life — away from photography. The 1978 introduction, in contrast, is raw and brutally honest. It’s the kind of essay that is rare coming from photographers, even from those who write well (who are, admittedly, in the minority). If you had any questions where this particular photographer might be coming from, it provides answers to all of those. 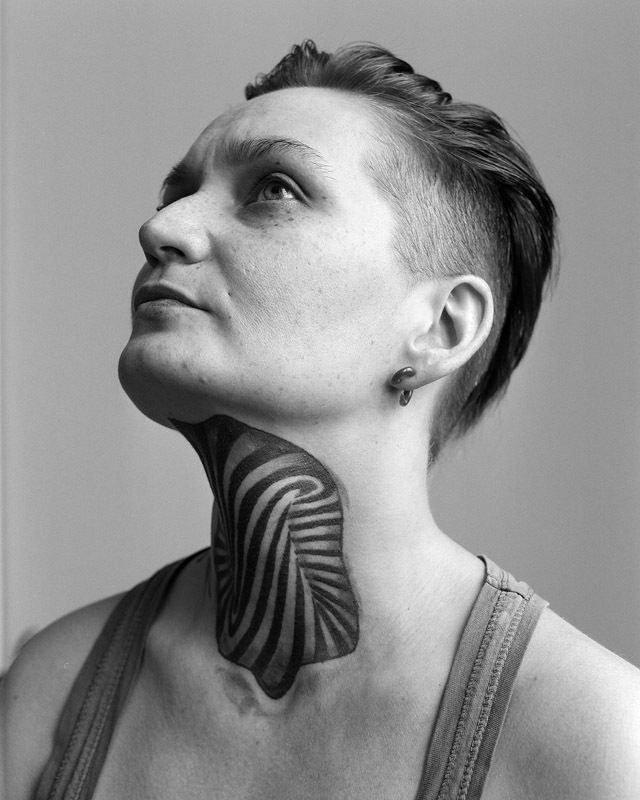 It makes clear the connections between the photographer’s biography and his work. Here is a man who deeply believed in what he was doing in and with his photographs, a man who would happily distribute leaflets outside of SFOMA, career consequences be damned. That incident was still in the future when the book was published. But anyone who read the essay could not really have been surprised. In a Postscript to his introduction, Hare writes “the photography world is not unlike the corporate situation from which I narrowly escaped. Hardheartedness and organizational thinking have stifled creativity and instilled conformity in many photographers. Success, most easily achieved by seeming to ‘extend tradition,’ seems to be more important than clear perception and truthful representation.” Hits home, doesn’t it? One of the many interesting aspects of Hare’s introduction is his willingness to disclose his methods. He freely admits to making sure he would get his picture, even if that involved a bit of deception — people often had no idea his very wide-angle lens would capture them. A man who happened to walk into a picture tells the photographer off: “You sonofabitch.” Hare: “That was the picture I was there for. That, to me, is magic.” I suspect many people will be deeply uncomfortable with the idea of pursuing an idea that is rooted in deep humanism by means which at times are not. According to the photographer, the cover picture of Interior America constituted the true beginning of the work. It’s a photo of a man named Orville England, with whom Hare later became friends: “acceptance by Orville gave me an increased measure of self-respect and self-trust — qualities suppressed in the aggressive, authoritarian coampany of my engineering peers.” While I was familiar with many of the photographs from the later Steidl version, the 1978 book unfolds in very different ways. It is not the almost sociological collection of people in their homes. Instead, it sketches out the larger landscape in the form of details from people’s homes and views of houses or even parts of towns outside. The variation ultimately makes the book a lot easier to engage with, and a lot more interesting than Protest Photographs. There is a flow to the work that the later book simply doesn’t have. And not much appears to have changed in these 39 years since Interior America was published — at least in terms of what is being depicted. Fashions and household equipment aside, the book feels very contemporary. The issues it speaks of have not only not disappeared, they have been pushed to the forefront, with so far mostly far-right demagogues and neofascists eagerly (and currently successfully) exploiting the fact that the country’s major parties have sold out those depicted even more to the corporations whose influence and role Hare was protesting against. Here then is another reason why looking at books published in the past is a good idea. If this particular book somehow had been published last year, with photographs taken in the same way, only, let’s say, 30 to 35 years later, it would make as much, maybe even more sense than when it was published in 1978. If photographs are able to change the world, the world might not have been told. To rely on photographs as being world changers, or to assume that the world will change simply won’t do. The world will only change if we all engage in making it happen. Chauncey Hare tried his part, and he eventually gave up on a world of photography that he perceived as being hostile to what he was after. As I noted elsewhere, the challenge is ours: We can either attempt to get some meaningful change done, or we can watch from the already irrelevant sidelines as even more people are getting crushed into the dirt (to use Senator Elizabeth Warren’s words).